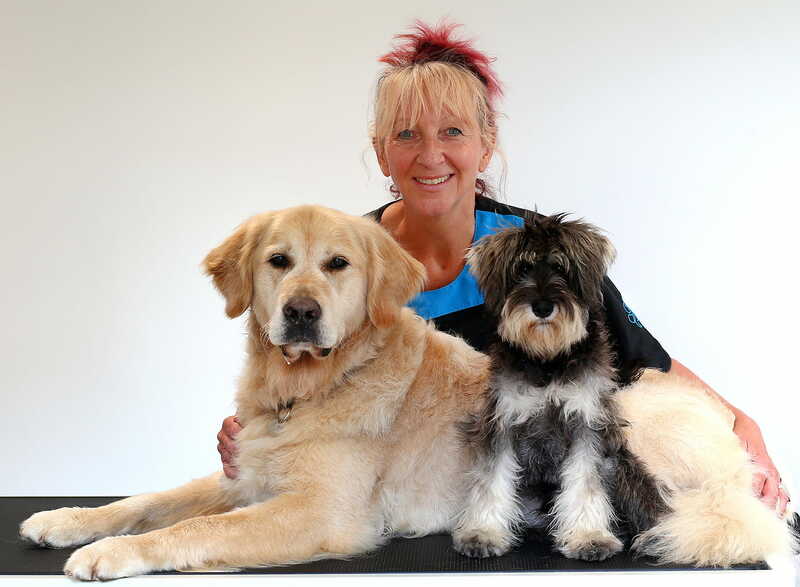 I'm Wendy, a fully qualified dog groomer and stylist and the owner and founder of Beachcombers Dog Grooming. I take a supportive and thoughtful approach towards all my clients who visit me at Beachcombers, helping to promote the health and well-being benefits of caring for the coats and skin of our happy beach loving dogs. Being by the sea affects the coats and skin of all our beach loving dogs. Here at Beachcombers Dog Grooming, I aim to redress the harsh effects the sun, wind, sea water, sand and pebbles have on the skin, coat and pads of our dogs that enjoy living by the sea. With my specialist knowledge and skills, I will work with you in creating an individualised Beachcombers groom for your dog’s specific needs. Take a look at my treatments where I can build bespoke treatment plans for your dog, especially if they need help to soothe dry, sore skin, repair and condition thier bleached, dry, tangled and broken coat or help to heal, moisturise and nourish the skin of thier sea-side paw pads. 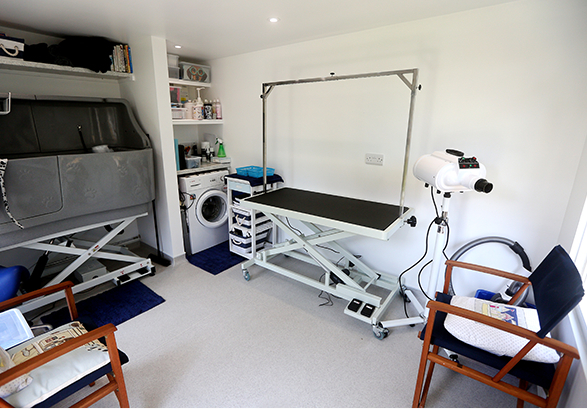 With state of the art equipment and resources, at my purpose-built Beach Hut dog studio in Worthing, West Sussex, I aim to offer the very best personal service to you and your dog. I strive to provide a relaxed and stress-free environment because I understand dog behaviour and how the experience of being groomed can evoke fear and stress in many dogs. By adopting confident, patient and gentle handling, with behavioural strategies based on animal learning theories, I work on reducing any fear and distress they may be experiencing and build positive relationships for future stress-free grooms. You can have confidence knowing my professional qualifications in dog grooming and styling give me the knowledge, understanding and skills to take complete care of your dog during their time with me. I am also a member of the Pet Industry Federation (PIF) and British Dog Grooming Association (BDGA). All my appointments are exclusive. I do not accept dogs for grooming without a pre-booked appointment as all appointments are scheduled for a personal one to one service. At Beachcombers, I always provide a free Consultation. This is where I discuss the health and well-being of your dog and take time with you to understand what your expectations are about the groom and styling you would like. I will also discuss the various treatment options that would benefit your dogs coat and skin. After each groom, I will give you feedback about any health conditions I may have been alerted to, how they coped with the groom and any other information related to keeping your dog comfortable and well. I carry out a thorough health check on every dog before the grooming and styling process. Diagnosis of a health condition is outside the role of any professional dog groomer. However, my knowledge and understanding of dog health enables me to identify discomfort or pain your dog may be in and to advise you if I have noticed any unusual signs and symptoms so you can discuss further with a qualified vet. If your dog does have a particular health condition, I am able to help you to monitor it each time they come for grooming. I am happy for you to remain if you prefer, so you can see how I work safely and how I am totally focused to promote a dog centered approach in the care I give at Beachcombers Dog Grooming. I don’t use strategies or equipment that has the potential to cause harm or distress to your dog. Important for you as an owner to know, that I do not use ‘groomers helpers’ - which are restraint bands and harnesses to keep a dog standing still on the table or in the bath. I will not use a restrictive cage to dry your dog in. I do not crate your dog if waiting to be picked up by you. These treatments are no longer covered on the insurance for pet groomers to perform, as they are considered veterinary interventions. However, I will notify you if there are any concerns for your dog in these areas so that you can consult with your vet. Even though I undertake a temperament assessment of each dog when I first meet them, and ask questions about their past experiences of grooming and being handled, sometimes a dog can become aggressive on the grooming table. I have to stop grooming if it is too dangerous to continue, but I can support a referral to the Canine Training College in Polegate, East Sussex where they work with dogs who present with dangerous aggression while being groomed.